A Bonaire delegation comprised of Yasmin Perez, Representative of TCB-Latin America, Eden Beach Resort and SunRentals attended the Expo-Buceo Mexico, which took place October 10 – 11, 2015.The Bonaire booth was conveniently located next to the PADI booth. 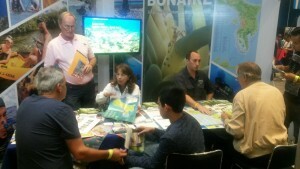 Throughout the Show, Bonaire conducted sales meetings to dive centers. As a result of attending the Show, TCB-Latin America gained knowledge on how to possibly attract Mexicans to Bonaire via Cuba. The route DF/HAV has an attractive rate, and Insel Air started to operate HAV/CUR. Other connectivity’s are also available from Mexico to Bonaire such as; United’s weekly non-stop via Houston and Delta’s non-stop to Bonaire via Atlanta. Visitors, who do not have a Visa, can choose the route Copa via Panama, or Avianca via Colombia. Mexico has a large dive population. Bonaire’s unique sales proposition in the Mexico market is that Bonaire offers diving 24/7, an eco-destination and is the #1 shore diving destination in the world. TCB-Latin America will continue to promote Bonaire to the Mexican market.